The Aerobed SleepSound Raised Double Inflatable Air bed is a comfortable raised airbed which inflates to the height of a traditional bed and is ready to use in just 3 minutes. The Aerobed's durable reinforced coil construction keeps the air evenly distributed all night long and provides a stable, even sleeping surface. A powerful mains flat panel pump with fast inflation and deflation does the hard work, so you don't have to, fully inflating and deflating in just 3 minutes. There is the addition of a super fast Whoosh valve which deflates the bed in under 15 seconds. Adjust the comfort at the touch of a button. 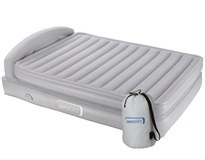 A convenient solution for overnight guests, the Aerobed SleepSound Raised Double air bed rolls up easily and is stored compactly in a durable carry bag for easy transportation. 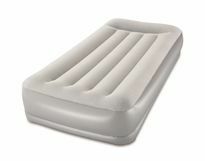 Aerobeds are constructed from a heavy duty puncture-resistant non-allergenic PVC with a velvety flocked sleep surface. Mains operated electric pump included for super fast inflation. Delighted with my purchase. Having spent considerable time researching an inflatable bed which is truly comfortable, I am really happy with my Aerobed which really does feel and look like a proper divan. I opted for the raised double as I am in my 60’s and felt together the height would offer my ease if use. Pleased with the price I paid from SlumberSlumber which was very competitive. 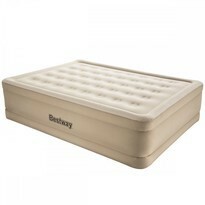 Very sturdy, my mum slept on this and said she slept really well. It didn’t deflate and was so easy to put up and down. First class bed. Many times better than a Livio I had bought before. Couriers slow Parcelforce maybe a better if dearer option. Item arrived on time was a good price and is exactly as promoted. Would buy again if I needed another. Was pretty concerned ordering a blow up bed but did a bit of research and decided on this one. It arrived on time and literally 5 stars all round. The guest said it was the best nights sleep and super comfy- didn't deflate at all. Was super quick to blow up and took us only 2 mins to deflate and slot it in the handy bag it came with. Defo recommend! Very quick delivery and item as described at very competitive price. The bed was used for a few days and there was no problems with it, the guests said the bed was very comfortable, good choice. 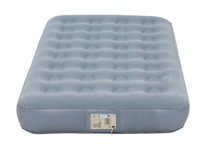 Unfortunately had to replace an existing air bed.Found this to be very comfortable,and the whoosh feature makes deflating it even quicker than the previous one.Maybe a queen size would have given us more room ,but overall happy with the purchase. My son and partner slept well with no complaints. Fast inflation also fast deflation. Worth the money. Although not used for sleeping yet we gave it a trial run inflating and deflating and laying on it. seems really comfortable and SO easy to inflate and deflate. No problem to fold it up and easy to put away in the bag provided. Very good efficient service too. Very pleased with this purchase. Bought It a couple of years ago, had a lot of use and still working as new. 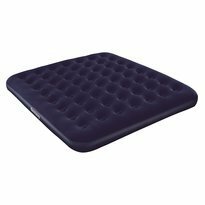 slept on it myself and is very firm and it doesn't feel like you are sleeping on an air bed (was better than my own mattress at one point). advice to put a layer (blanket) in between the bed sheets and the air bed, the cold can get through the mattress if you just put a sheet down. bought a second one for my mum for overnight guests. defiantly a product I would recommend. so easy to pack away and room up. oh, and the travel bag is big enough that you don't have to force the product back into the bag. This is 2nd arrived I have purchased. Delighted with this product. Bought this a few weeks ago for when my daughter comes to stay with us, previously we got her one from another company that has the metal "frame" that the matters sits on. Only used it 5 times and the seal where the pump fits tore, so I thoroughly searched Google for a replacement. 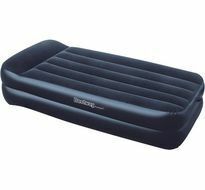 Read the wonderful review on this higher inflatable bed with a great price reduction and it was used last night for the first time. She slept like a baby!! She's 37 actually, thought the soft top was great as covers stayed put, firmness stayed all night and so easy to assemble and deflate. Well done Slumber, Slumber and potential buyers, this is the one for you!!! We have blown up the bed as a practice run for when I will be needing it. Everything looks fine, and it's very comfortable. Thank you for good instructions. After reading a number of reviews I bought this bed from Slumber Slumber who were offering it at the best price. My nephew, who is 6' 4" and weighs approx. 17stone found the bed to be very comfortable. It stands at a good height and is incredibly easy to inflate/deflate using the inbuilt motor, taking less than three minutes to fully inflate. Delivery from Slumber Slumber was prompt; overall an excellent purchase at a very good price. Makes all the difference to getting off an inflatable bed when you get older! The unit was delivered as promised. First use it lost a little pressure overnight but since then has been airtight. 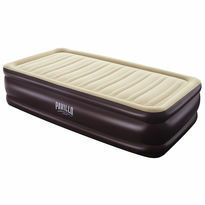 A good quality airbed. Easy to inflate/deflate with electrics. 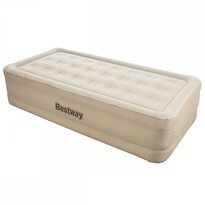 Would recommend for ease...4 stars and not 5 due to comfort but yet to find an airbed as good as a normal bed! This bed is miles ahead of the other air mattresses we have had. The quality is evident, from the electric pump to the overall design. 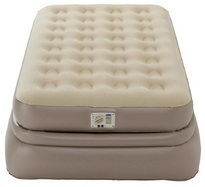 But most of all it is super comfortable and supports like a proper mattress! Worth every penny. Fab bed for when friends come to stay! The kids loved bouncing on it too! Great service & prompt delivery would highly recommend. Bed arrived three days after it was ordered. 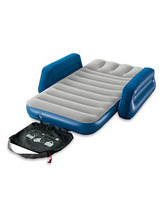 It inflates well and is very comfortable excellent service for an excellent product. Fantastic bed which has now transformed our two bedroom flat into a three bedroom when guests stay over. Quick to inflate and deflate, comfy and easy to store away. This was also the best price I could find on the net! The aerobed was delivered promptly as requested. Ii inflates and deflates really easily via the built in pump. I had a really good and comfortable nights sleep on it. I am 16 stone and have previously slipped a disc in back and am very particular about where I sleep. My normal mattress is a top of the range Tempur, so I was amazed at how comfortable this mattress was. VERY HIGHLY RECOMMENDED and the customer service, which I had occasion to use ,was second to none. Thank you. A very well priced product that is very comfortable, delivered on time and so far so good. This is a great product. Really impressed. Fabulous, quick inflate/deflate & comfortable, good purchase. Aerobed is a must for anyone prone to a surprise visitor or is the surprise visitor (it has a handy carry bag). It was a bargain for such good quality, arrived quickly, well packaged and bed itself is incredibly easy to set up and store away. The WOOSH valve really makes that noise and is very effective! It's worth getting the raised version with the inbuilt pump for comfort and ease. Fantastic product, service and value. 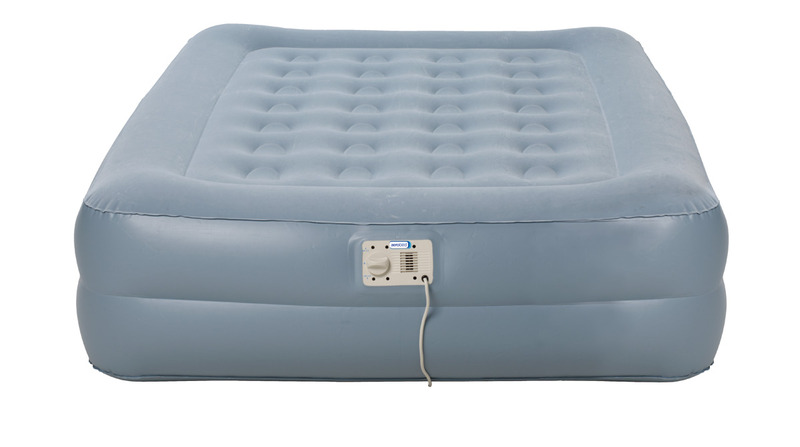 I have had so many inflatable beds which are not the most comfortable or the easiest to Inflate/deflate & pack away , but this one is fantastic easy to Inflate just as easy to deflate and it actually fits in the holdall provided plus my guests said they had a great night sleep, well worth the money . Excellent quality, so easy to use and great that it has a guarantee. I have grown tired of having poor quality blow up mattresses which fail on the first use - this mattress is great! Also would like to mention the excellent and quick customer service! We got the package delivered quickly. Everything is good with the bed. It's high and comfortable and gives a good sleep as well. Very comfortable for 1 person and alright for two. Deflates a little over time but not much. I think you can easily just inflate it a bit again. Easy to carry and fold away. 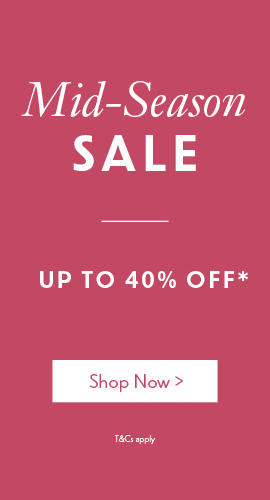 For less than 70 pounds its a good deal. Recommended. Purchased for use by the occasional guest. Very pleased with the inflate/deflate function. It has yet to be used by us. Really comfy! Easy to use and pack away! Like having a spare bed that doesn't take up loads of room! Good price too! We have had this up and in use for 2 weeks now and only minimal air top-up required. Delivery was top notch - very quick. Although not actually tested yet (Taking it overseas) it inflates and deflates quickly and packs away perfectly. Having read all the other responses we are looking forward to comfortable sleeps in future. Excellent customer service when our initial enquiries were made. Hi, I ordered this bed over the Christmas period, was delighted by the attention and fast delivery at this busy time. The item is everything it said it was, very happy. Excellent as it does what it says on the box. Quickly inflates and deflates. Very comfortable to sleep on. Packs up into bag well. Is the pump built into the aerobed please? Yes, the pump is built in and mains generated. The Aerobed Comfort Classic Raised Inflatable Bed would be one of if not our most popular models and many would find it to be more deluxe than the Sleep Sound range. Can you tell me what combined weight the double will hold, ie 2 people sleeping on this. The overall maximum weight that the Aerobed Sleep Sound Raised Double Inflatable Airbed will support is 204kg. Should a puncture or hole become apparent or if the pump should stop working then this will be covered by the guarantee. 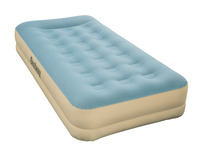 Are the classics and the sleep easy inflatable mattresses both the same height? We confirm that these are both the same height. Unfortunately all our Aerobed’s require a mains electric pump. A few customers in the past have purchased a Power Inverter from Halfords and have been able to use this device to gain power through the cigarette lighter of their car to pump the bed up.